Theresa May has bowed to pressure from a group of Tory MPs and ministers and agreed to give Parliament a vote on delaying the UK's departure from the EU on 29 March. This will take place only if MPs reject her Brexit deal for a second time when they vote on it next Tuesday - and then also say no to the UK leaving the EU without a comprehensive, legally binding agreement, the so-called no-deal scenario. With just 22 days to go, Parliament has yet to approve the terms of withdrawal negotiated with the EU. MPs will have another "meaningful vote" on Theresa May's deal on 12 March and insisted that if MPs back her, the UK can still leave as planned just over two weeks later. 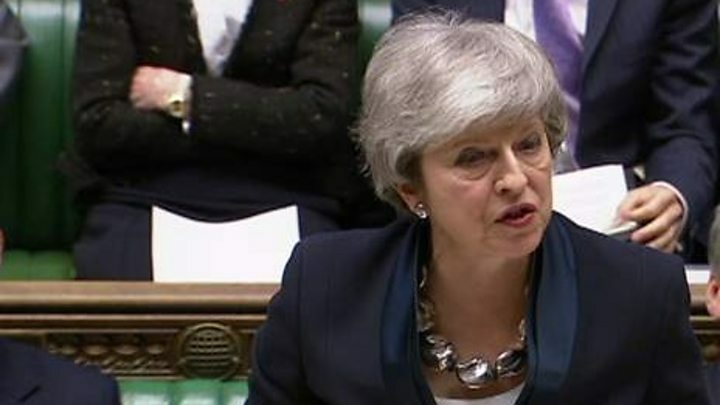 In the event of MPs backing a pause in the Brexit process, the PM has said she will seek the "shortest possible" delay, while also refusing to rule out the UK still leaving without a deal later in the year. So if not 29 March, when could the UK actually end up leaving? The first thing to point out is that any decision to delay the UK's departure by extending the Article 50 process would have to be agreed by both the UK and every other EU member. The EU has sent out slightly mixed messages on the question, with some senior figures saying a delay would be sensible while others argue there would have to be a good reason for it. But assuming the EU agrees to it, the first alternative Brexit date that has been touted is 18 April, which happens to be Maundy Thursday. The thinking behind this is that it is also the last day in which the European Parliament can vote on issues before it breaks up ahead of May's Europe-wide elections - more about those later. Members of the European Parliament (MEPs) also have to approve the deal although unlike MPs, who rejected the agreement by a margin of more than 200 votes, they have yet to consider it. If the UK and EU run out of time to come up with a solution to address MPs' concerns about the current deal - and EU leaders won't hold their next summit until 22 March - or if Mrs May loses MV2 by a narrow margin, there could be a short "technical" delay to allow everyone to regroup and make one last push to get it "over the line". If the UK Parliament finally consents to the withdrawal agreement in late March or early April, it is thought that MEPs will soon follow suit - although expecting them to do so right at the last minute carries obvious risks. And would this tight-ish timetable give the UK enough time to prepare for an orderly departure? Irrespective of whether MPs agree to the deal, there are a number of other complicating factors. First of all, MPs wrote the 29 March exit date into UK law when they passed the EU Withdrawal Bill last year. This would need to be superseded, although this is done relatively easily by way of a statutory instrument. Furthermore, Mrs May has promised to enshrine the withdrawal agreement in domestic legislation by passing an Act of Parliament. It normally takes months for bills to pass through the Commons and Lords. Although the PM has indicated the withdrawal and implementation bill could be fast-tracked, some MPs and peers may kick up a fuss saying two weeks does not leave enough time for proper scrutiny. Thus 23 May or thereabouts has emerged as a possible new Brexit day. This, the thinking goes, would allow the UK two further months to fully prepare itself for leaving. 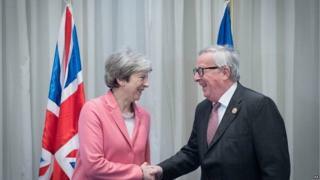 It would also see the UK leave before the outcome of May's European elections, due to take place between the 23 and 26 May, in which it will not play any part. Simon Hart, a member of the Brexit Delivery Group of Tory MPs, has proposed tabling an amendment advocating a "strictly time-limited" delay until 23 May although this was withdrawn after Mrs May urged MPs not to "bind her hands". Image caption Can Brexit wait until after the summer holidays? If there are no signs of the two sides finding a solution to the thorny issue of the Irish backstop, then a slightly longer delay becomes a possibility. Pushing back Brexit by about three months to the end of June would not be ideal for either side. But it would be an admission that more time is needed for negotiations, particularly if the EU doesn't fancy, as has been reported, making further concessions that it can't be sure would be accepted by MPs. Leaving on 23 June, on the third anniversary of the Brexit referendum, would be particularly sweet for many Brexiteers although the issue of ratification by the European Parliament would still be outstanding. Newly elected MEPs from across Europe aren't due to take their seats until early July although they could conceivably convene a special session earlier or, possibly, approve the Brexit deal retrospectively. There will be a big incentive to get the whole thing done and dusted before the end of July, both for political and more worldly reasons - no-one will want to see their summer holiday plans disrupted if at all possible. Image caption Could British MEPs have "observer status" in Brussels until the UK leaves? Once you get past the end of July and the evenings start to draw in, that's when things get trickier. The EU may be willing to grant one extension to the Brexit process but a series of rolling delays is reportedly not to its liking and a lengthier hiatus may only happen if there were a general election or another referendum. That said, senior EU officials are reported to have mulled delaying Brexit until 2021 - in the hope the two sides will have negotiated their future relationship by then and this will sort out all the issues relating to the backstop. But this is likely to be unacceptable to Conservative MPs, and millions of Leave voters, as it would mean the UK was still part of the EU more than five years after it voted to leave in 2016. There is also the small matter of Europe's parliamentary elections. Could the UK remain in the EU for an indefinite period without sending representatives to Brussels and Strasbourg? Theresa May has suggested this would not be viable but experts, such as the Institute for Government, have pointed out that there may be ways round this dilemma - in the short term anyway. These could include the UK's existing MEPs being granted "observer status" with no voting rights or the UK sending national representatives, as Romania and Bulgaria did for four months after they joined in 2007. Another potential option would be for the UK to re-elect its 73 MEPs - whose seats would otherwise be re-allocated - on an interim basis but to hold the polls at a different time from the rest of the EU. But the cost of doing this would be controversial and would the Conservatives be willing to put up candidates when they were likely to be accused of betrayal by, among others, Nigel Farage's new Brexit party?